Many companies, businesses and even homes have long practiced the use of local networks. It is very convenient and economical. But there are situations when you want to create a separate user group, United in a different local network. It is absolutely not necessary to completely change the architecture of the network. There are several ways to partition a local network into subnetworks. The simplest way to just change the IP address of the required computers and the subnet mask. Open settings of the network adapter. Locate the "TCP/IPv4" and go into its properties. You will see IP address, say, 100.100.100.8. and subnet mask 255.0.0.0. Change the IP address to any other address, for example: 210.50.150.8. The subnet mask will automatically change to 255.255.255.0. Do this for the rest of the computers that you want to separate from the local network and combined into a new one. Note that when you enter a new IP address, the first three segments have to do the same on all computers. If you want to completely eliminate the possibility of information exchange between computers of two different LAN networks, get a switch. 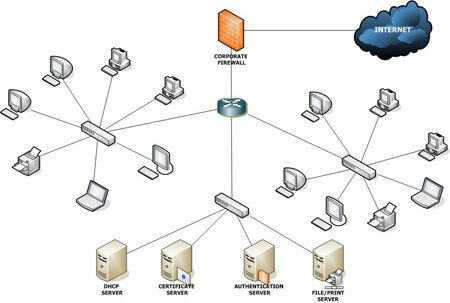 Connect all of the computers that you plan to separate from the old network. Simultaneously, the above disconnect the device from the old switch or switch. As a result, you will get two independent local area network. The IP addresses of the computers you can leave the old, because it will not hurt network performance.